Are there any pictures of early camouflage patterns on panzers? seems a sort of yellow over factory panzergrau. Were there yellow paints used? Or sandcolor as in N Africa? I was a moderately proficient amateur photographer in the 1970s and 1980s. Although I worked mainly in black and white, I did a little colour work and had a bit of an interest in the history of photography. I suspect that your picture was taken on Agfa film, which was a relatively early but still quite advanced colour film in WWII. However, like all early colour films it had a tendency to cast towards various colours, which could be accentuated by the processing and printing of the image. If you look at your image you will see that the grass and flesh colours aren't quite true to life, and may be suffering from a yellowish or perhaps brownish tinge or other interference with the true colours which would also alter the tank's true colours. You will also see that there are yellowish / brownish spots in the sky which might be processing faults or age marks which might also have occurred on the tank to create the impression of camoflauge. Similar faults appear elsewhere in the picture, notably around the arse and shoulders of the soldier on foot at bottom left. Note also that the greyish feldgrau on the soldier on foot bottom right is shifted towards faint jungle green in the previously mentioned soldier bottom left but is brown on the soldiers on the tank. 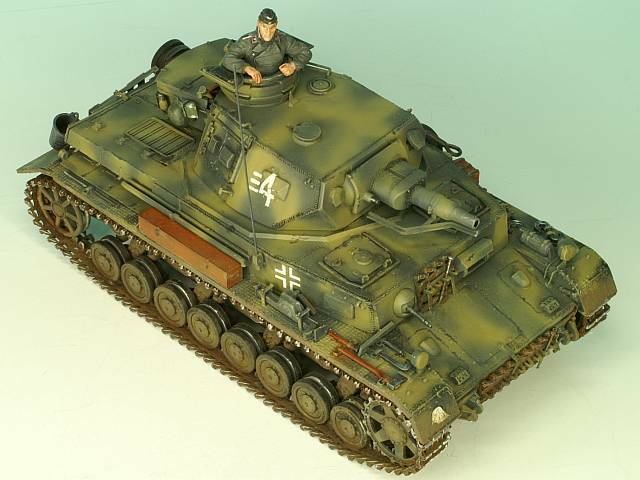 You'll probably find more help in establishing the colour of the tank from the picture on historical photo forums than war forums, unless someone on a war forum has details on that picture. Exposure times also will cause color shifts in the finished print. Too little, and the colors are bold, too much, and they go to pastels. Processing temperatures will do similar things, both in film, and print processing. Also, is this image taken from a book, or archive. Book images are often out of balance, and has this image been colorized from a B/W that would account for the warm shift in the colors, as well as mis assignment of colors by software. Just thoughts. this picture is well known I guess. Perhaps it's a just another colorized "SIGNAL" propaganda picture. Showing a pzIV F/2 or G, this picture can't be made in 1941, as stated on the website. So it must be 1942, probably fall blau. It has typical blops on the painting, looking a bit like a snowpanther. it could be a panzer III painted for the N African theatre. I don't know enough about the vegetation in North Africa to know whether the grass in the picture could be there, but I suspect it's more likely to be somewhere in Europe, particularly as the troops aren't wearing Afrikakorps uniforms. There would be little point in trying an African camouflage pattern in Europe. Then again, all military forces can be relied upon to engage in monstrous stupidity at times, so anything is possible. many Afr. purpose-painted tanks were sent to Russia.